We have a new regular visitor: a red-tail hawk, about 18" tall, that has been visiting balconies on the north side of the building. One tenant has named it "Clarence." 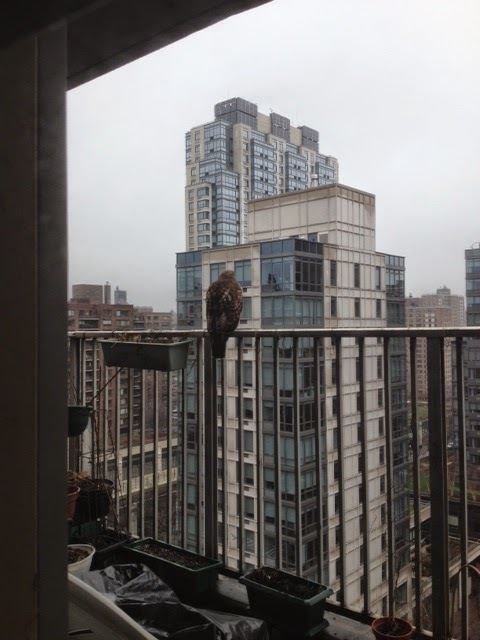 It may be one of the offspring of Pale Male, a famous NYC midtown hawk. It has a completely white front (with a little colored belt), and a touch of rust on its tail - until it flies, when you can see the full display of reddish-rust color. Hawks are lovely to watch, but they are birds of prey. So please keep your toddlers, small dogs and cats away from the balcony.